Wilson Tucker is credited with coining a term that all diehard SF readers have seen, countless times. What was it? Need a hint? Think of the far future with mankind zooming around the universe. Answer, of course, will be next time out. Tucker came up with a label for such epics during the 1950’s, relating them to an American tradition at the time, the Western. Such movie and book extravaganzas culminated in such John Wayne epics as El Dorado and Rio Lobo (I picked these two out of the huge list to note because they were written by a well known fantasy writer by the name of Leigh Brackett) and were often called . . . horse operas. Tucker coined the term space opera in recognition of an American taste for expansive vistas and larger than life figures and there never was any doubt the term would catch on. It was a natural. As is the case with Wilson Tucker’s best work -- natural, and very American. The winner this time was, coincidently, a newly minted contributor to Dark Moon Rising, Bob Dodson, whose illustrations have graced the cover a couple of times and who, in this last issue had four poems published. Congratulations Bob and I’ll get the book to you immediately. This will be a shorter column this time for a couple of reasons, some personal, some professional, and some just quixotic as hell. The keyword for the column, as it were, is the term short. As in short story, as in short life, as in short, intense acclaim before the long dark. This is column is about a figure who graced the SF genre for an all too brief a time: Stanley G. Weinbaum. Collecting him isn’t hard. And that’s a pity because the reason it isn’t hard, is that Weinbaum died before his career had a chance to take off. For the brief space of less than two years, his work had begun to, in the words of Chalker and Owings, “revitalize the field” as well as the SF community. He began to attract a wide audience and then sadly, he was gone. He isn’t, of course, the first nor the last of the important writers of SF (or of any type of fiction) to die too soon. The name Henry Kuttner comes to mind and I’ll have a column about him specifically some other time. But Weinbaum is unique in a number of ways. He was distinctive; he had range; he was very original in his material. Weinbaum was born in 1902 in Kentucky and went through the public school system of Milwaukee, graduating finally from the University of Wisconsin in 1923 with a BS in Chemical Engineering [Footnote 1]. 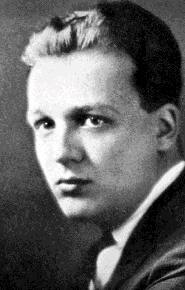 His first published work, “A Martian Odyssey”, was published in the JUly 1934 issue of Wonder Stories, and is considered a classic and groundbreaking and about a dozen other superlatives. This is hardly odd when you consider that variants of his original story have been creeping into SF for the last 70 years. Read it—you’ll find where quite a few writers got ideas – original ones of their own, but sparked by Weinbaum [Footnote 2]. Over the next two years, before his death December of 1935 of lung cancer [Footnote 3], Weinbaum became a staple of both Astounding and Wonder Stories and attracted praise from the likes of both E. E. Smith and H. P. Lovecraft. His death was a shock to the science fiction community. The Black Flame - Fantasy Press, 1948, cover by A. J. Donnell, 240 pp., $3.00, Reading Pennsylvania. A Martian Odyssey and Others - Fantasy Press, 1949, cover by A. J. Donnell, 289 pp., $3.00, Reading, Pennsylvania. 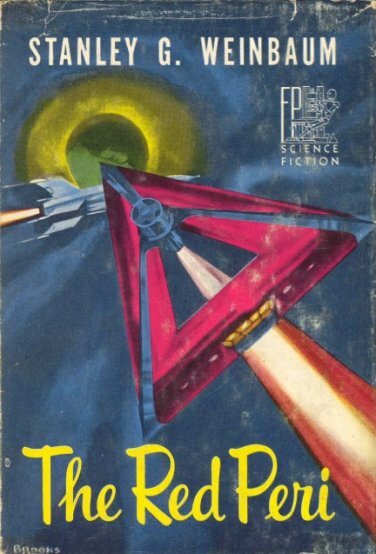 The Red Peri - Fantasy Press, 1952, cover by John T. Brooks, 270 pp. $3.00, Reading, Pennsylvania. Prices for the Fantasy Press books are, as I’ve noted over the last couple of columns, not bad these days. Decent copies of the first editions—not the variants mind you, but the standard First Editions with good dust jackets begin at about $40.00 and go up from there. You’re liable to stumble across some copies, by the way, that have famous autographs in them as well – many, many writers of the three genres respected and admired Weinbaum and made a point of having a hardback copy of his work. I know that some of those personal libraries have been broken up and sold over the years so keep your eyes open. Finally, there’s a bit of a bizarre note I should bring up. The original versions of the two stories in The Black Flame, are lost and have never been printed. They were abridged in the original magazine publication and the versions found in the Fantasy Press volume comes from them. Forest Ackermann had the original manuscript but that was stolen from him around 1960 and has never been recovered. There’s a chance that it may, someday, resurface and I would urge anyone who has a love of writing and good writers, to keep their eyes open. It would be fitting to have it appear in the version that Weinbaum penned and intended. Stanley G Weinbaum was known for his inventiveness and, at the time, solid science in his fiction. Today's SF, of course, runs the gamut between what is really fantasy and hard science fiction typified by such writers as Asimov, Brin, and Bedford (to stick to the beginning of the alphabet). One hard SF writer in particular, who's been at it for nearly forty years, has built an extensive universe and populated it with entirely believable critters and peoples. Who is the creator of the following species: Pak, Trinocs, and Outsiders (which has nothing to do with HP Lovecraft, bear in mind)? Footnote 1: Interestingly, Weinbaum was, apparently a class mate of Charles Lindberg. Footnote 3: There’s some disagreement on the web whether the cause of death was lung cancer of throat cancer. Take your pick. Footnote 4: I confess to a bit of confusion here. There is a story listed in most of the bibliographies of Weinbaum but it does NOT match the title of the story in this collection. The listed story is “The Revolution of 1950”—but the title of the story in the collection The Red Peri is very definitely printed as “The Revolution of 1960”, which makes sense when you consider that the book was published in 1952, two years after the revolution,. The obvious conclusion is that Eshbach retitled the story for the publication of The Red Peri because of the 1952 publication date, but I’ve seen no mention of that, anywhere. Comments?